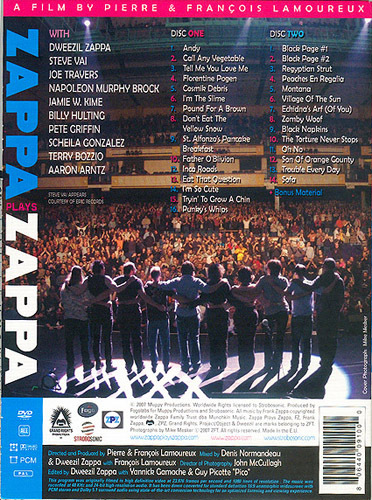 A printing error on the back-cover of the DVD: the tracklist for disc one jumps from 10 (Father O'Blivion) to 12 (Inca Roads), omitting number 11. "First and most obvious grateful recognition goes to my Dad for being the brilliant architect behind all of this incredible music. I love you and I miss you. This adventure would not have been possible without the love and support of the 2 most beautiful and hilarious women in my life, my wife Lauren and my daughter Zola. This DVD is dedicated to them. 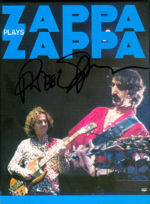 Brobdingnagian thanks for immeasurable support: Gail Zappa Corresponding. Skookum thanks to: Moon, Paul and Mathilda, Diva, and Ahmet. Special Thanks to those who have taken the heat and shared in the challenges of making this tour and DVD reality: Danny Heaps, Charlie Boswell, Melanie Starks, Mike Mesker, Gary Iskowitz, Andrew Tennenbaum, Owen Sloane, the whole team at Fogo, Lisa, Denis, Yannick, Pico, Matt but especially Pierre and François. More Gratitude to: Andrea, Matthew and Doug 'Dipper' Knudsen, Blues Saraceno, TJ Helmerich, Rob Cohen, Adam and Lazlo Small, Chunga, Pimplimociccio, and Bustopher. A bit more to: Steve Vai, Terry Bozzio, and Napoleon Murphy Brock. One final helping of appreciativeness goes to the band. All of you have been truly remarkable to work with and I'm damn proud of you. See you at the next concert,"
2 DVD ? 2007-11-17? ? US packaging DVD 9 Dual Layer, all regions, 16:9 NTSC. First copies sold during the ZPZ show in Paris on October 5th 2007. This page was last modified on 19 September 2008, at 11:05. This page has been accessed 12,125 times.